It seems the hardest part when trading crypto is finding the right strategy in volatile and unpredictable market. But how do you know if your strategy is successful? To answer this question, it’s important to decide how you will measure your results. First, you need choose a currency to measure your results in and then compare your performance to a benchmark. Then look at the missed opportunities to find out whether you would have received more profit from investing in something else or just HODLing your assets. Measuring trading results in crypto market can be tricky, so in our today’s article we’ll break it down for you. In traditional finance, the value of a portfolio is usually tracked in fiat currency. In cryptoworld that’s rather challenging since the quote currencies in the trading pairs are usually major crypto coins such as BTC or ETH. Exiting to fiat currency almost always implies high fees. Some traders opt for trading in stable coins such as USDT or TUSD to fix their profit on one hand and avoid taking a hit from volatile crypto market on the other hand. This in fact can be a solution, but the stable coins are still cryptocurrency that are exposed to risk of potential market manipulations. There’s another nuisance that may complicate estimating trading results in USDT. Let’s say a trader closes a deal trading BTC against some altcoin. The value of the asset has increased in USDT, but has decreased in BTC. The overall trade was unsuccessful, but the measuring results in USDT won’t reveal it. Other traders combine trading and investing approach and fix their income in Bitcoin. They aim to increase the value of their portfolio in Bitcoin as they believe that in the long term the value of the first cryptocurrency will increase. In fact, blending trading and investing approach seems like a wise strategy, but cryptomarket is very young and it’s nearly impossible to predict it’s direction for the next month, not to mention the next year. The second step in measuring the results of your portfolio comes from traditional finance. Alpha is commonly used as a performance indicator of an asset against some benchmark. As benchmark usually serves different indices. In case of cryptomarket a good benchmark can be a Total Market Capitalization (TMC) or different indices elaborated by funds and analytical agencies to represent overall market direction. Let’s say your portfolio has gained a profit of 10% in the last month, whereas the Total Marketcap has increased by 15%. The growth of overall market is 5 point more than your portfolio’s gains, and you alpha in this case is -5%. That means that your asset is underperforming and maybe you should look into regrouping your portfolio. Even if your trades perform well against a benchmark, it may still be interesting to have a look a the missed opportunities. Let’s say you have just purchased ETH with tokens you were holding. The value of ETH went up, but even more did the value of sold tokens due to an announcement of partnership with major player in cryptomarket that you missed. Crypto market is maturing rapidly and Bitcoin volatility is at the record low values. However, the market is still sensitive to big news, events and announcements that shoot up the tokens’ prices. It may be reasonable once in a while to take a look at the opportunities that might’ve brought you more profit and make corrections to your long-term strategy. You may also use different portfolio rebalancing tools such as automated instruments or excel sheets available on the Web. But do not forget to conduct your own research prior to making a decision. Let me show you on the example of my trading activity how I estimate my trading results. On October, 3 I deposited 5 ETH to my exchange account. I decided that I’ll use ETH to measure my trading activities and in case of success trading strategy the value in ETH will increase. As of January, 31 my deposit grew by 6.82% or 0.34 ETH. 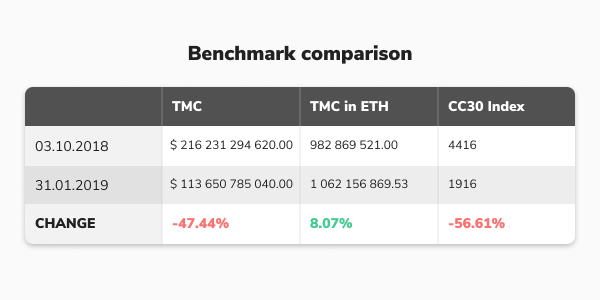 I did well compared to the Total Market Cap Сhange calculated in $(6.82% against -47.44%), but my results weren’t that outstanding if we recalculate the Total Market Cap value in ETH (6.82% against 8.07%). I also outperformed CCI 30 Cryptocurrency Index. However, if I would’ve transferred my funds to USDT and then bought ETH back, my deposit would be worth 92% more and would equal 10.28 ETH. Nevertheless, if i had opted to lend my money through Bitfinex funding or ETHlend platform, I wouldn’t have gained as much. The conclusion I drew to myself is that I should take into account sudden price drops and hold some part of my deposit in stable currency. To sum up, you may track your portfolio’s performance and trading results in 3 steps. First choose a currency to measure your results. In USDT you will have a clear understanding of your funds growth in “real money”, although there’s a chance some trading results may be misinterpreted. 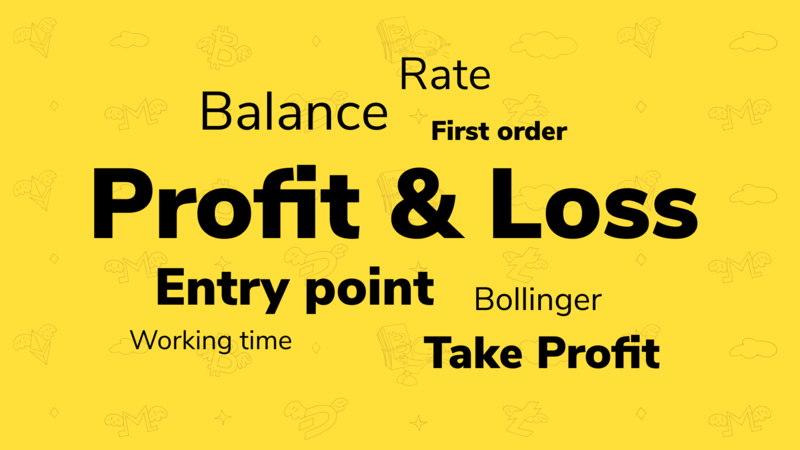 You may see the total Profit you made by trading with bots in USD in Dashboard in your account on TradeSanta. If you’re a HODLer and believer in crypto it makes sense to use BTC or ETH to asses our portfolio’s value. If your quote currency is BTC TradeSanta bots will close a deal with the profit in this very coin. Second, evaluate your trading performance against some benchmark such as Total Market Cap or Top20 Index to see how your trades are looking against overall market direction. Finally, research missed opportunities to see how could you improve your strategy. Don’t forget to look into TradeSanta to see how automating trading may benefit your trading strategy.